Green Island with its long boat jetty ….. the island is a central cay of white coral sand with a dense forest of broad leaved pisonia trees. 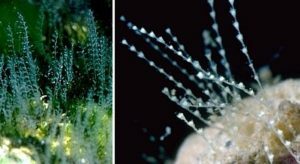 Hydroids: These were microscopic, colonial fern-like organisms which lived a stationary jelly fish like existence in beautiful translucent tiny exo-skeletons. They cement themselves to floating seaweeds or sometimes on the undersides of boulders. Green Island with the aquamarine tide in over the beautiful coral reef. When the tide goes out you can walk out for 100 m ++ over the exposed coral reef. Tertiary studies towards a Science Degree: I had started tertiary studies towards a Science Degree at Avondale College, near Cooranbong, NSW. It was in 1968 and I had just turned nineteen. I had developed a great interest in marine biology through my very enthusiastic lecturer Dr. Brian Timms. I had become absorbed in the study of hydroids. These were microscopic, colonial fern-like organisms which lived a stationary jelly fish like existence in beautiful translucent tiny exo-skeletons. They cement themselves to floating seaweeds or sometimes on the undersides of boulders. See the photograph above. I had begun collecting in free student times from the nearby coast at Norah Heads. I would dehydrate them in varying strengths of alcohol to finally pure alcohol. I would then stain them with a purple dye which was picked up differently by the organism. These would then carefully mounted on a glass slide then covered with a thin glass cover. Under the microscope, the organism would be a darker purple and the clear exo–skeleton would be a faint purple. The jellyfish part of the organism lived in this wine glass like clear receptacle ….. just beautiful and so graceful! I had fellow students, the Kum Yuan brothers who were from Cairns. When the August holidays came up, a friend Ross Cuthbert in my class and I decided to hitchhike to Cairns and back again in ten days ….. the exact length of the August holidays. Hitch-hiking then was very acceptable thing then but not now with the frequent spate of violence against hitch-hikers. 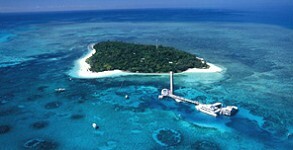 Our aim was to camp on Green Island off Cairns as a tropical island and I could do some hydroid collecting. It was the first hitchhiking trip I had undertaken. I had special permission from my parents to complete the trip. Ross and I left, at the start of the August holidays with ten days to get to Cairns and back again. We were hitch-hiking outside Raymond Terrace in the evening. It was very cold and we both had thick coats on. A man picked us up who said he going all the way through to Kempsey. When we got about ten miles south of Kempsey, he said he was stopping to camp in the campervan on the back of the ute. This was on the side of the road for the rest of the night. We were dumped out on this black, forested section of highway. What were we going to do? It was then that a big semitrailer started roaring down the straight stretch of highway with its lights blazing. I had a small penlight which I tentatively waved in the darkness as the truck roared by. I didn’t know what else to do. Suddenly, the truck pulled up with a screech of brakes. The driver jumped out and asked us if he could help us. He bundled our loaded packs under the tarp and set off to the turnoff to Mullumbimby many hours away. We were so tired and all we wanted was to snooze. The driver wanted to talk to us to stay awake. We eventually made it to Mullumbimby turnoff by sometime in the morning. Mum and Dad came and picked up two very tired students. After a day’s rest at Wilsons Creek, we set off for the northern part of our trip. We camped at Caloundra on Saturday. That night, when we started out again, one of the local journalists came and took our photo for the local paper. Ross had a copy of that extract sent by his mother’s aunty who lived in Caloundra. He has just given me a copy recently as I am still in contact with him. We then obtained a lift with a couple from Maryborough. The driver drank all the way home, with his wife continuously passing him stubbies of beer. They said they would put us up for the night when they got home. All I remember is that the driver’s wife had to help him steer the car through the home gateposts. He was a little under the weather ! They were kind to us and gave us a hot breakfast in the morning and set us on the highway. We were then picked by a policeman in civilian clothes who was going right through to Rockhampton. We were there by lunchtime when he dropped us off. We waited for a new lift for hours but there no cars leaving of Rockhampton for northern areas. Frank Bobongie was a South Seas Islander fellow student who turned up in the same place and said the same thing about no lifts. He was trying to get to his hometown of MacKay and had rung his brother, Dennis, to come and pick us up. MacKay was at least 160 kilometres (100 miles) to the north. Dennis came and collected all us and about 10 p.m. at night, dropped us at the Websters. Graeme Webster was also in my Science classes and had previously invited us to stay at their house overnight. The next day they took us down to the boat for Green Island, our desired destination for the whole trip. I was interested in collecting and mounting on microscope slides, more hydroids from a tropical location. My aim was to camp on Green Island but on getting off on the end of the jetty, we all saw a big sign about a $200.00 fine for camping on the island. That was a little dilemma ! I said to Ross that I was not hitchhiking 2000 kms. for nothing. Ross said that he would go back on the boat in the afternoon and hitched back to College. I began exploring around the island. I went fishing on the jetty. I had a handline with a big jag of hooks at the end. There was a big school of sea mullet which passed under the jetty. They were about 100 mm in thickness and 750 mm long. I jagged one of the fish and pulled it up to the jetty. I caught several other large reef fish. Was I excited ! What was I going to do with them? I needed to clean them and cook them. It was lunchtime. Then I saw a family on the beach who had lit a fire. I went down to them to see if I could use their fire. I explained my circumstances, it turned out that that family knew the Kum Yuans. They sort of took me under their wing. I cooked these fish in alfoil and shared them with the family. That night I went around the end of the island to sleep under the trees above the beach. I pulled out my sleeping bag and no one knew I was there. In the morning, I then went collecting hydroids on the reef after the tide had gone out. In the afternoon, I caught the boat back to Cairns and started hitching back to College. I got down from Cairns a certain way and as it got later, the driver asked me home for the night. He gave me hot breakfast in the morning and set me off again. The cultural climate has changed altogether to how it is now. People were so trusting and helpful back then. I eventually made it back one day late and had to pay a re-register fine for that. It was a trip I well remember! !